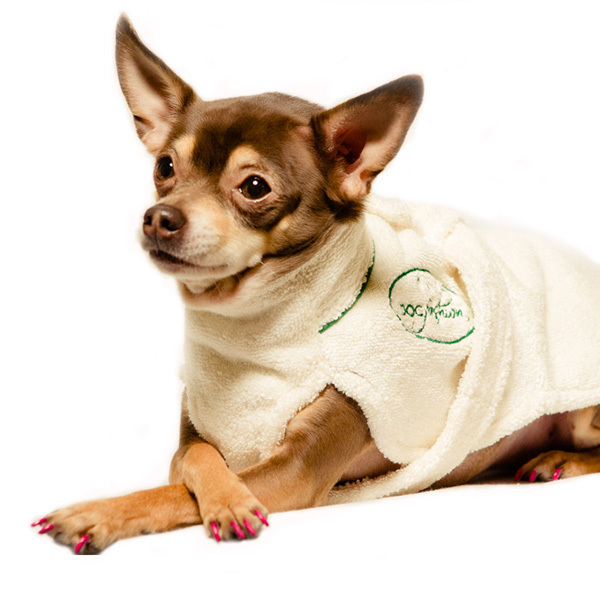 Discover Yap Dog Fashion bathrobe for dogs from YDF line that magically gives a dog the impression of having a spa day and captures the essence of Quality Life for Dogs®. Does your dog get impatient when being dried after baths? Yap Dog Fashion bathrobe for dogs will help drying the coat after dog wash and will keep your fur baby warm and comfortable. Made of the finest cotton to keep your furry baby comfortable, this doggy bathrobe was designed to help comfort a dog after bath time or anytime and bring smiles to everybody’s faces! Try Yap Dog Fashion female bathrobe from YDF line to complete the set so your dog can wear a matching robe! create a spa day for yourself and your dog at the same time! Whenever you choose for your dog to wear yap dog fashion bathrobe, we guarantee your dog will steel everybody’s attention! Size guidelines: teacup (3-5 lbs), xsmall (6-8 lbs), small (9-13 lbs), medium (14-20 lbs).